This year, the venue hopping part of the music festival that is Live at Leeds once again managed to bag itself another sunny day... so my friends and I began by dwelling inside a really dark Brudenell Social Club. We were there to see Various Cruelties; a London based band fronted by Leeds lad Liam O'Donnell, a previous stalwart of the local acoustic scene. He now has a very competent band in toe, with an enthusiastic bassist injecting enormous grooves into each song and a guitarist making every note appear effortless. Liam appeared to be more comfortable and relaxed on the songs which required his guitar duties, but when allowed to focus purely on vocals with tracks such as 'She's The One' their sound really stood out as a result of his powerful, soul filled voice. Fortunately both roles came together brilliantly on set closer 'Chemicals’; a big anthemic number which I can see being loved by such a diverse range of music fans that it makes the band's name seem like a bit of a misnomer. After quickly getting a taxi across town we arrived just in time for Sam Airey who had filled Holy Trinity Church to capacity. He blends the gentle finger picked subtleties of Nick Drake, with poetic verse, and as the songs unfold Sam channels his passion and aggression in a way that Conor Oberst does so well. Accompanied by rousing cello, the music suits the venue perfectly as Sam's voice resonates around the rafters beautifully especially on unreleased track 'The Unlocking'. The audience were enraptured throughout and Sam appeared somewhat overwhelmed by their unanimously positive reaction. Next on our hit list were Falmouth's Tall Ships in The Cockpit's main room. The majority of bands have a different member responsible for each instrument, but the multi-talented members of Tall Ships can't be so easily defined. Guitars are looped and then ditched for synths or extra percussion as the band set about putting together their rhythmic creations. The result of this being a large amount of head bobbing and dancing from the sizeable crowd. They left us with forthcoming single 'Hit The Floor' which has an infectious riff, and enough bass to rattle some fillings. They'll be back at Nation of Shopkeepers on May 25th in support of Three Trapped Tigers. Don't miss out on that. We arrived at the O2 Academy to see swarms of people piling into the venue for electronic pioneer James Blake, whose set was unfortunately plagued by sound issues throughout. Although loved by many DiSers, I failed to connect with his music. Having come straight from the frenetic energy of Tall Ships, I found him to be very static viewing and despite his impressively crisp and clean vocals, the slow development of the songs was rather boring. Opinion appeared divided with there being plenty of crowd chatter, alongside an annoying sea of phone screens set to record. On a side-note I'm not sure the Luddite that I am will ever get used to seeing someone play an electronic drumkit live - although it was a good way to fully show off the octopus like drummer. After some brief refuelling, we headed to see Mazes in the back room of Leeds Met. The 3 piece have created one of the most fun albums of 2011 so far - full of short, punchy numbers that will soundtrack lo-fi lovers' summers in the way that Wavves and Spectrals have previously. The bands' moody inward demeanour made it feel as though we were looking in on a garage rehearsal, although the songs were played out faultlessly. Unfortunately the set was cut short much to the bands and audiences' annoyance as a result of a massive soundman error, who had failed to realise the lead singer was just changing guitar. Big shame, hopefully they'll be back in Leeds soon. 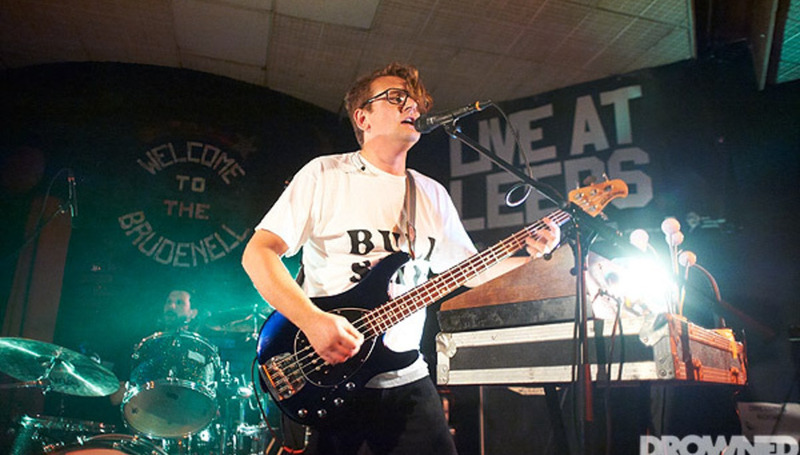 Next up was Honour Before Glory back at the Brudenell. A band fronted by familiar face Whiskas and comprised of an ever changing mix of Leeds musicians. Together they built epic songs that should soundtrack those bits in films where the hero leads the underdog army into battle. Stand out track was 'Lions', which can and should be downloaded from their website for free. Thanks to some generous car sharing we made it back to the Academy in good time for Frightened Rabbit. From the off they appeared to be relishing the large stage with frontman Scott Hutchison launching himself and his guitar about with reckless abandon. He did calm down briefly for a beautiful solo acoustic version of 'Good Arms vs Bad Arms' before bringing it back with 'Living In Colour'. We were treated to songs from all three albums but the band revelled most whilst performing the uplifting newer songs like 'Nothing Like You', for which the drummer almost looks primal throughout. A triumphant and deserved headline performance. Our night ended at a sweaty Leeds Met for Pulled Apart By Horses; a band that never take themselves too seriously. After a long day of beers and rum I can't remember which and in what order songs were played, but I can tell you that they all sounded ear pummellingly great, the new material seemingly stolen from the wet dreams of Bill & Ted. The set flew by, even when deranged guitarist James Brown stacked it mid-song and, this instantly forgotten, they continued to tear into tracks. The crowd was rammed and the sticky mosh pit spread far, those that claim rock is dead need to delve a little deeper. Overall a fantastic day in which I managed to see a great mix of artists both local and nationally known, most of which impressed. I'm sure that had I visited other venues I would have been equally rewarded too, thanks to such a vast programme of choices. Another plus is that the event seemed to run like clockwork and free from the queuing problems of previous years, everyone who wanted to see a certain act was able to. No doubt the result of a lot of thought. I'm already looking forward to next year.